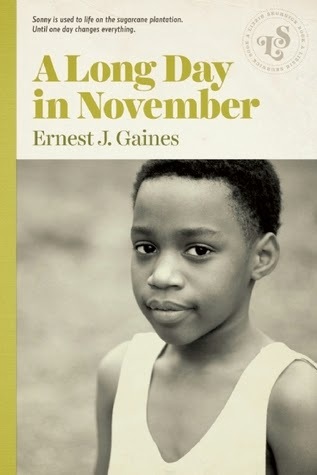 On a November day in the 1940s rural South, six-year-old Sonny wakes up to find his parents' marriage in turmoil. His mother, convinced that Sonny's father Eddie loves his car more than his family, decides to move to her mother's house down the street, dragging Sonny along with her. Desperate not to lose his family, Eddie spends all day seeking advice from friends and a local woman who practices voodoo, before ultimately sacrificing his car for the love of his wife. This slice of life story is fabulously well written. By telling the story through the innocent eyes of young Sonny, Gaines is able to provide an unbiased account of both parents' actions, leaving room for the reader - ideally a middle school student - to draw his or her own conclusions. What is for Sonny just a really long day is for the more sophisticated reader an opportunity to understand what it was like to live on a sugarcane plantation during this time period, and a study on human relationships and what drives people to behave as they do. Though the novel itself is short, there is much to discuss and dissect that can easily encourage multiple re-readings. Kids in grades 6 to 9, especially, will have much to say about the decisions made by each character, and will delight in the final scenes where Eddie makes his choice and follows through. Historical fiction can be a hard sell, but once kids find out that this is essentially a book about breaking up and making up, they will be all over it.